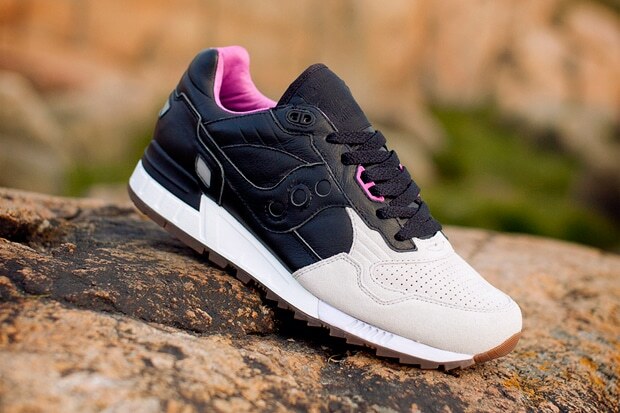 We had a deja vu moment when we first saw these Saucony Shadow 5000s. We’d seen most of these colours four years ago and assumed that they were just a tribute to the ALIFE A.R.C. trio of Shadow 6000s from 2008 (those things were incredible), with their Air Max 1 style palettes. None of that’s a bad thing though — this model looks fantastic when it’s given the right colour blocking, with the ionic cushioning of this iconic 1989-era runner built into a dual-density sole unit with a striking heel counter and the XT 600 carbon rubber outsole. The mix of what feels like a premium suede and the lighter synthetic suede and those different mesh textures, plus those embossed ridges on the upper to complement all the other curious technical-looking markings that this model is festooned with, all reiterates just how elaborate this design actually is. We always preferred the Shadow 6000 upgrade, with its wedged sole, but this model is still banging. It’s also crazy to think how much has changed in terms of hype for the three dots too — once upon a time, nobody on these shores seemed keen on ’em, unless they were former athletes, shoe connoisseurs or straight edgers, but now the thirst levels for the shoe are parched when it comes to special projects. These are a good complement to the recent 6000s in the similar colours, and they’ll be in the store shortly.